I am frequently asked whether consultation is a legal requirement in planning. The fact that it is impossible to answer in fewer than 100 words exemplifies just how complex community involvement in planning has become. And so I, and other Associates of the Consultation Institute, very much welcome the Interim Report of the Raynsford Review and the very constructive steps that it recommends in bringing about greater clarity and consistency. Members of the Consultation Institute’s Planning Working Group – all communications / planning professionals working in planning and development – have considered the Report’s recommendations and their potential implementation. Although there is no expectation that the nine propositions will result in immediate changes to planning law, much of what is recommended, along with our commentary on them, might be regarded as good practice and therefore is worthy of consideration by planners and developers. Despite growing concern about public disaffection in the planning system, there has been no comprehensive review of the relationship between planning and people since the 1969 Skeffington Report. The Report received a positive reception, but few of its recommendations were put into practice – apparently because they were too vague and intangible. And yet the Skeffington Report had an enduring influence on community involvement in planning – to the extent that Skeffington is said to have influenced the introduction of Localism over forty years later. The statement was based on research carried out by the then Department for Communities and Local Government which found that as a result of pre-application consultations there was a 10-15% fall in the number of appeals, hearings and enquiries. Additionally, a YouGov poll for the National Housing and Planning Advice Unit had demonstrated that 21% of respondents opposed new housing supply in their area, but that this number fell to 8% if homes were well-designed and in keeping with the local area. Localism (which was itself instigated by the need to substantially increase the UK’s housing stock) was based on the belief that local involvement would deliver greater consensus. In an environment in which local comment on development proposals was generally negative, this was a bold approach and one which should have begun by communicating the benefits of consultation in bringing about appropriate development. Unfortunately the Government – unlike Raynsford – failed to do so. The eventual Localism Act was significantly less bold on the requirement for consultation than it had originally intended: while the Bill set out to enshrine a requirement to consult in law, the Act omitted the requirement to consult on planning applications in England and Scotland with the exception of planning applications for wind turbines. So the legal requirement for consultation in planning remains vague and widely misunderstood, and the work of the Raynsford Review in demystifying this is much welcomed. So it is without hesitation that the Consultation Institute supports the Raynsford Review’s call for greater clarification on the role of community engagement in planning. Specifically, we welcome the proposed covenant for community participation which has the potential to formalise requirements for consultation in appropriate circumstances, rectify the uncertainty about when a developer is required to consult and clarify the expectations that local communities should have of the planning system. Such a covenant would require clear definitions of consultation / participation / involvement / engagement and the circumstances in which each should be used. All too frequently the terms are used interchangeably at considerable risk to the developer or planning consultant. ‘Engagement’ and ‘participation’ refer to an ongoing, generally long-term dialogue and can vary significantly. ‘Consultation’, however, as a result of considerable case law mostly outside the development sector, has become very litigious. Specifically, the courts view consultation in the context of the Gunning Principles and where these are not upheld, decisions can be overturned by the courts. Similarly, the ‘three pillars’ (Articles 4-9) of the Aarhus Convention (named after the location of 1998 United Nations’ Economic Commission) stipulate three public rights regarding access to information, public participation and access to justice in governmental decision-making and, like the Gunning Principles, have become an important benchmark in consultation, specifically in relation to dialogue between the public and public authorities. The Consultation Institute hopes to work with the TCPA on a draft covenant for community participation and, as the Interim Review recommends, would use both the Gunning principles and those of the Aarhus Convention as its basis. We also see the final report of the Raynsford Review as an opportunity to raise standards in consultation. Specifically, a renewed focus on consultation can put in place measures to ensure that dialogue is efficient and meaningful without being excessive, ensure that involvement of a wide range of groups in the local community, and put in place some guidance on how consultation results are used. The latter does not simply concern issues with evaluation, analysis and reporting (though there are certainly opportunities for improvement at this stage), but also the need, at the start of any local dialogue, to agree and clarify how feedback is to be used. Confusion on this issue is unsurprising. In the case of a Neighbourhood Plan, a local referendum determines the final decision, yet community responses to a development application are generally only regarded as ‘advisory’ and secondary to that of the professional team. Consequently local communities remain confused about the intended use of their contributions and this is a primary reason for dissatisfaction in the current system. Promoting community involvement as a central tenent of planning, one that is structured by guidelines and inspired by best practice, has the potential to tackle many of the issues that continually perplex planners and developers. While the Consultation Institute is a strong advocate of good consultation, we do not prescribe consultation in all circumstances. Each development proposal is different: some benefit from community input from the very outset, while in other cases viability issues prevent community involvement in all but a handful of decisions. We believe that where consultation on a planning application is appropriate, it should be efficient and meaningful, without being excessive and a selection of means by which this might be achieved is summarised below (Efficient and meaningful consultations). The proposal for ‘a new professional culture and skills set directed at engaging communities’ is long overdue. Planning consultants and developers are generally highly trained, their undergraduate and postgraduate degrees covering a wide spectrum of skills. With only a few exceptions, however, consultation has so far featured on very few syllabuses. 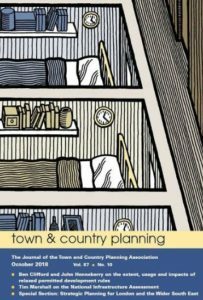 In fact when I published my book Public Consultation and Community Involvement in Planning: a twenty-first century guide last year, it was the only book on consultation in planning to have been published since the Skeffington Report almost fifty years earlier. Through other generally more litigious sectors, the Consultation Institute has contributed to a professionalisation of consultation through quality assurance, consultation industry standards of practice, professional accreditations and CPD and we see considerable benefit in these benefits applying to the development sector. Similarly, the Consultation Institute is fully supportive of the Interim Review’s proposition for a new ‘creative and visionary’ planner. We see some excellent examples of creativity and innovation in consultation – both within the planning sector and elsewhere – which could be communicated more widely across the planning sector and inspire more positive community engagement. We look forward to the publication of the Raynsford Review, and with it the development of the very many positive ideas that are contained within the Interim Report. As a next stage, we see significant benefit in guides on consultation in planning for both the development industry and for local residents; the creation of a ‘good’ consultation kitemark for the industry; training for planning consultants on consultation, and a formalised means of best practice across industry, specifically on subjects such as online consultation, evaluation and analysis, the use of co-production and participatory planning. There is no doubt, as the Interim Report acknowledges, that it is, ‘a challenge to define how much power communities should have as compared to the development industry or national Government’. Striking a balance between achieving growth and giving existing communities a voice is a perpetual problem, but one which can be lessened and in many cases overcome through an appropriate and considered approach to community consultation. Consultation must be held at a formative stage, so that respondents have maximum opportunity to influence decision making. Consultation must provide sufficient opportunities for ‘intelligent consideration’, so that respondents can come to informed opinions. Consultation must provide adequate time for consideration and response, to ensure that respondents have sufficient time to come to and express a view, and that there is sufficient time to properly consider that view. Consultation must ‘conscientiously consider’ feedback received. Gain a thorough understanding of the target consultees, especially any ‘hard to reach’ groups. Determine how consultation responses will be used at the very start of the process. If community feedback is to advise, rather than determine the resulting decision, this should be clearly stated. It is also helpful to state how anonymous responses, petitions and comments from outside any defined geographical area should be used. Where possible, meet with community support / neighbourhood involvement officers to discuss how to ensure effective access for hard to reach groups. Carry out initial research including stakeholder and issues analysis. Draft a consultation mandate, stating the target audience, the aims and objectives of the consultation, the subject for discussion, how the results will be used, the organisation initiating the change post-consultation and its timing. Ensure that the consultation mandate is communicated effectively, including on all consultation material. Hold the consultation at a formative stage, so that respondents have maximum opportunity to influence decision making. Provide adequate time for consideration and response (both in the consultation and the analysis of it). Avoid a clash of consultations – for example, consulting on a development planning application during a Local Plan consultation. Allow no fewer than six weeks for a standard consultation; more if a significant holiday period falls during this period. Ensure a range of tactics to appeal to the range within the community. Consider all tactics in terms of access – both physical and psychological. Consider innovative tactics to make the consultation more engaging. Use a variety of tactics to inspire involvement. Consider tactics most likely to result in constructive responses. Understand the specific groups that make up the neighbourhood and ensure that consultation tactics are targeted suitably, investing in translations if necessary. Provide adequate information to enable consultees to make a fully informed response. Combine both quantitative and qualitative research techniques as appropriate. Ensure that questions and accompanying information are free from technical jargon. Evaluate the consultation responses as set out at the start of the consultation. Provide feedback to those who took part.